The importance of showcasing your brand’s story and engaging with your target audience to be more authentic is no secret nowadays. We all know you must make your brand stand out from the crowd, and cut through the noise to boost your chances of maximizing sales. However, it’s also paramount to ensure that all of your content is relevant to your audience. Going off-piste can easily lead to a PR disaster, or a brand dud. Just because it’s creative, doesn’t mean it’s right for YOUR business. After all, we can’t all be wacky online pioneers — someone has to be the designated driver. Here are three ways that cautious brands and marketers can start to break out of the digital mould — without breaking any bones. For great pointers on how to create hot, relevant content, check out this post. Your content must connect back to your brand mission, services or product offering. You don’t want to leave your target audiences wondering why you chose that particular marketing message. The quirkier your marketing message is, the more you may have to work to make the link clear to your audience. You should thoroughly plan your marketing, and ensure that your brand values are the focal point. Don’t underestimate the power of using traditional, physical marketing techniques for online brands. This could be a great way for you to give your brand a human face, and offer your target audiences a fun, physical experience. 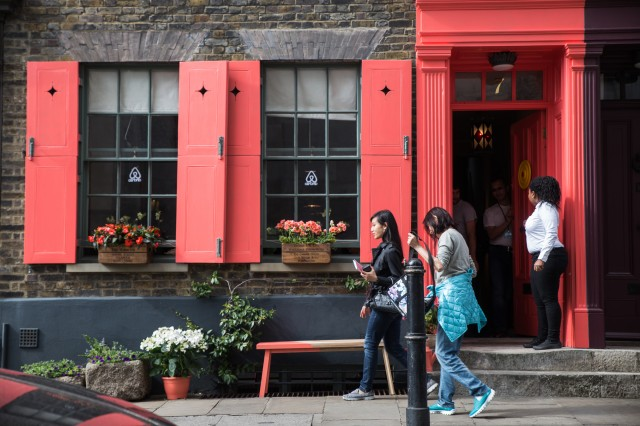 Take a look at Airbnb’s pop-up house in London with ‘Live There’ campaign for inspiration. If you’re an SME working with a smaller budget, why not try issuing physical content with printed leaflets or brochures, or perhaps hosting a small stand with a representative to talk to members of the public about your product offering? Controversy can be a powerful way to get your brand coverage in the media, and make your brand name stick in people’s heads. However, you should understand that there are different types of controversy. Sexual innuendos are controversial and can sometimes be used, but they can imply predatory behavior – as Bloomingdale’s discovered with their failed holiday catalogue in 2015. To avoid the mistakes of Pepsi and Bloomingdales, consider the audience that will be viewing your marketing, and make an informed decision about what content would be appropriate. You must ensure credibility with a quality data source for all claims or statements you make. Sweeping generalizations or false truths are not acceptable – do your research and have your claims backed up with hard facts. Doing research can even give you creative inspiration and new avenues to explore with your marketing. Is your product used by a certain kind of person? Do you have a high customer satisfaction rating? This data can be invaluable, so consider sending your customers questionnaires to collect it. If you can’t source the data yourself, source some from a third party. Marketing data is one of your most powerful tools when producing content. This, alongside thorough research, can be the backbone of a successful, creative, and engaging marketing strategy. Using data will make sure that your marketing messages are never off-piste or offensive. Simple, UX web design has become the norm, with most content management systems coming complete with a selection of elegant, pre-designed themes that people can easily customize. Sure, they look good — but aren’t all websites starting to look eerily similar? How about changing that? Should you really sacrifice all creativity in the name of UX and ‘rules’? So why not include a bit of creative flair in your online branding? 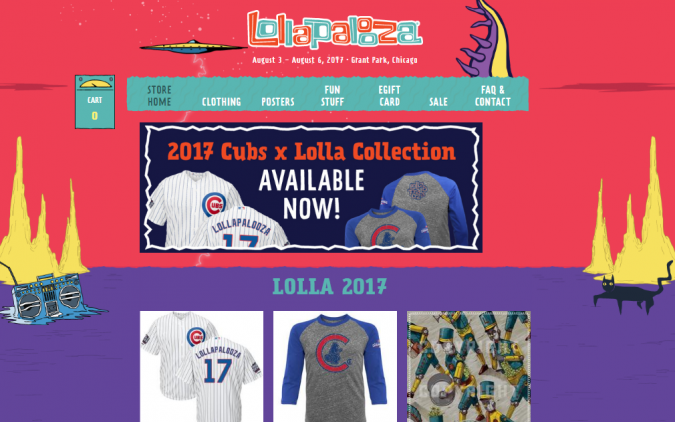 Lollapalooza, a festival, has a merchandize shop that sells branded t-shirts and accessories. This online store, created with Shopify, is proof that you don’t need to follow the herd with digital branding. This brand features quirky animations all over its website, and it is this fun approach to branding that contributes to company’s overall image. The random UFOs, cats and boomboxes have become part of the festival’s signature style. Lollapalooza is recognized as an up-and-coming, fashionable festival, and this is (at least in part) because of its branding that appeals to younger generations. Does your online business need a branding overhaul? Are there any relevant cultural themes or trends that you could incorporate into your site’s design? Rebranding your online business is your chance to have a real impact on your target audience when they land on your website. You can check out this article for more information. You’ve probably seen memes floating around online, but have you considered employing them in your content marketing strategy? It may seem daunting to get involved in such potentially controversial and trending topics, but don’t let this deter you. Memes can be a fantastic opportunity for you to engage with a wide variety of audiences, and inject a strong dose of personality into your brand. Memes work very well on social media as they are very easily shareable. They add value to for viewer, whether it’s entertainment or information. 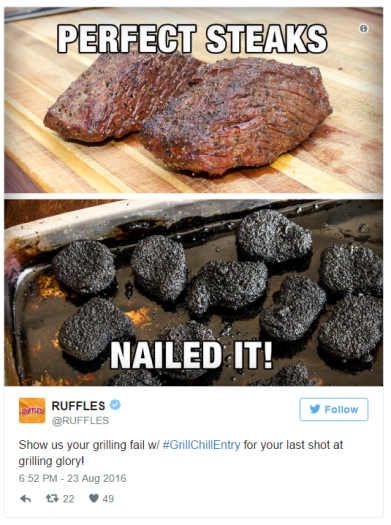 Ruffles Grill regularly use memes to communicate with their customers on Twitter. One such example involved the ‘Nailed it!’ meme to encourage their audience to participate in a user-generated content competition and enter photos of their culinary mishaps. This meme use has received great reception, and boosted Ruffles’ engagement rates considerably. You could get involved in the meme craze yourself by using tools such as Meme Generator that allow you to caption an image of your choosing and upload it wherever you please. The trick is to ensure that you personalize the memes to suit your product offering and brand values. Memes can be adapted to be fit for any purpose, even serious ones. You can repost pre-existing memes too, as long as they are relevant to your brand message. Using memes can boost your brand’s personality, and it allows you to join in with social media conversations with more ease. With a thorough plan and a little creative flair, you can transform your brand from plain Jane to exciting and influential, without burning any bridges in the process. Ensure that all of your marketing messages are linked to your brand message and core values, but don’t be afraid to think outside the box from time to time with a new tactic or platform. Which of these ideas would you like to use for your online brand? Let us know in the comments. Patrick Foster, ecommerce expert & writer: I am a freelance writer, and I spend my time writing for a myriad of digital publications on a range of topics from ecommerce to social media. I’m passionate about business, startups and entrepreneurship. Running my own side hustles since 2010. Thank you for sharing your ideas with us. Inspirational post . I read the whole post and learnt something new.